GTYC Club Racing is a friendly competition that sees owners and crews learn from each other and improve their skills to get the best out of their boats. The Handicap system allows for different boats to compete together on a levelled basis so everyone has a chance of winning if they sail their boat well. Visitors and New members are always welcome at GTYC and you don’t need to own a boat to get involved! 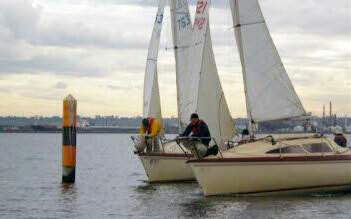 Existing members are often seeking additional crew, especially for club racing. Crewing for other members is a great way to get involved in sailing and all it costs is a crew membership at GTYC. You can come and try sailing for free any time and sail up to 3 races before being required to become a member. Let us know if you are coming down for a sail so we can make sure we have a boat for you to sail on. If you are looking to purchase a trailable yacht, why not come down and sail with some other boat owners to try different boats. It might help you find the boat that’s just right for you. Each year there is a Traveller Series which provides a great opportunity to do what trailable yachts do so well… travel! The 2018-19 Traveller Series includes 7 regattas across the state including our own Pelican Race. See the Yachting Victoria Website for further details. These great regattas provide an opportunity to sail in larger fleets and meet other trailer sailor enthusiasts from all over the place. There is usually a few members from GTYC that are keen to go so if you can’t get a full crew for these races, join with others that are going.